Am new to growing veges, have just moved to a place with a bit of room so this will definitely be on my list for next year. yum yum fresh asparagus. 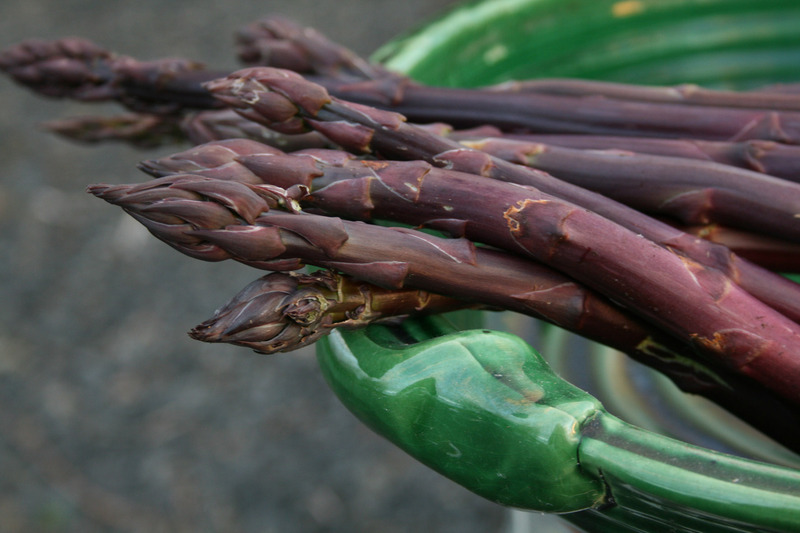 Lucky you…..can’t wait till next season when i can eat my own asparagus. 🙂 In the meantime im looking forward to it appearing in vege shops and markets really soon. ooohh Lynda, it was that number 13 that did it for Wales then? I have THREE miniscule (about the size of a large darning needle!!) spears sticking up – after my dismal efforts to grow asparagus… but they won’t be eaten (unless by slugs) but next year – am holding out for a supremo crop. Love the sound of dinner too. And as for your potatoes, guess your local farmer’s market knows what it’s going to be up against when they are ready. Wish I had 90 hectares to indulge my garden/veggie passion too. Poor Jason.. wonder when the next lot of fences will be moved. I’m as green as asparagus with envy! Are these new asparagus beds, that you have waited patiently the required three years for while the crowns built up their strength? You inspired me to buy asparagus for tea tonight, but not grow it (yet). Must find more patience.